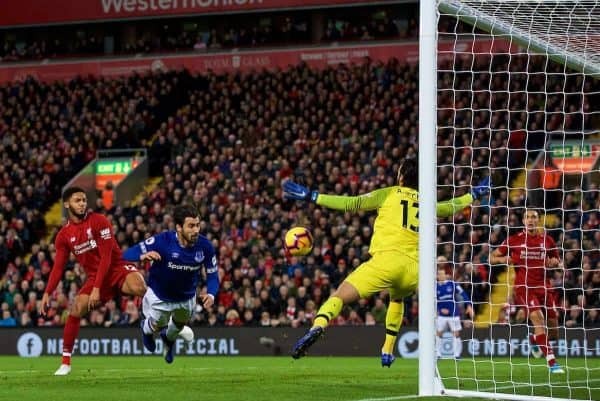 Liverpool sealed an incredible late 1-0 win over Everton in a fierce Merseyside derby that saw Jurgen Klopp‘s side keep up their pursuit of Man City. 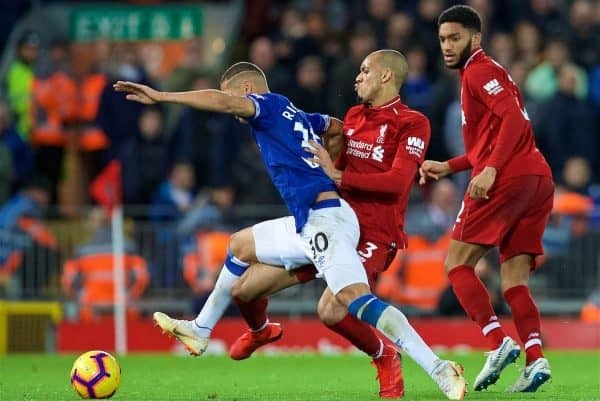 Anfield hosted its 100th Merseyside derby on Sunday, with Liverpool keen to preserve their excellent record of not having lost to Everton at Anfield since 1999. After a disappointing display at PSG in midweek, Klopp made three changes to his starting lineup, with the suspended Jordan Henderson one of those dropping out. Local lad Trent Alexander-Arnold and summer signings Fabinho and Xherdan Shaqiri all came in for their first starts in the derby, with the manager deploying a 4-2-3-1 formation. Up against a new-look Everton side under new management in Marco Silva, the pressure was on the Reds to maintain their unbeaten start to the league campaign, and that they did. The derby began with a high tempo, with the home fans creating an impressive atmosphere, but Everton almost struck an early blow as Yerry Mina headed just wide from a free-kick. Liverpool quickly grew into the game, however, with Sadio Mane the livewire in the final third and Mohamed Salah drifting into space as the focal point of Klopp’s attack. The end-to-end action continued as Andre Gomes had a free header in the six-yard box, with Alisson making the save from point-blank range and Joe Gomez sliding in for an incredible block on the goal-line. At the other end, Jordan Pickford denied Shaqiri a fine opportunity, before Theo Walcott attempted to round Alisson only for Liverpool’s No. 1 to get a touch on it. The whistle blew for the break with Anfield having witnessed a breathless first half, but with little end product on show from the hosts. Salah kicked off the second half with a brilliant curling effort that required Pickford to tip it wide, as Liverpool mounted the pressure around Everton‘s penalty area. Mane sent a pair of efforts just off target, one from close range and one from outside the box, and as the hour mark passed the Reds looked in need of a change. The man to come on was Naby Keita, taking over from Shaqiri but with the system staying the same, with the Guinean initially taking up duties on the right until Daniel Sturridge and Divock Origi were introduced. 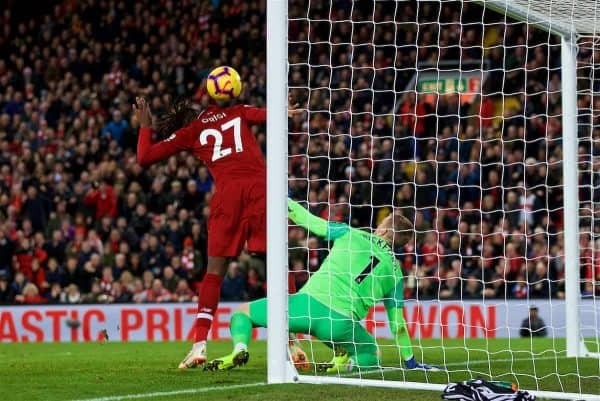 Origi almost made an immediate impact, skipping past Mina before winning a corner, and then striking the woodwork from the resulting set-piece. And the Belgian, a forgotten man on Merseyside, emerged as the late hero as Pickford’s error handed him a tap-in on the line in the last minute of stoppage time.